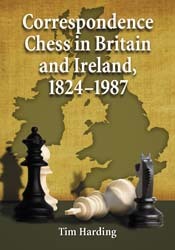 1962 saw the formation of the British Postal Chess Federation (BPCF) to oversee the running of the British CC Championships and provide a united body to deal with international affairs. The newly formed federation duly affiliated to the ICCF and England have been members ever since. Scotland and Wales had formed their own CC federations in the late 1970′s, gaining partial membership of ICCF in 1981 and full ICCF memberships in 1991, whereas BPCF has represented England internationally with ICCF. The name was changed to the BFCC (British Federation for Correspondence Chess) in 1999 to reflect the fact that CC was no longer postal only, and then again to EFCC (English Federation for CC) on 1st January 2015. Although the EFCC represents England only, the federation continues to assist players from Northern Ireland when required. The EFCC remains proud of the numerous tournaments they have organised allowing Title opportunities not just for English players, but also for players from all over the world.